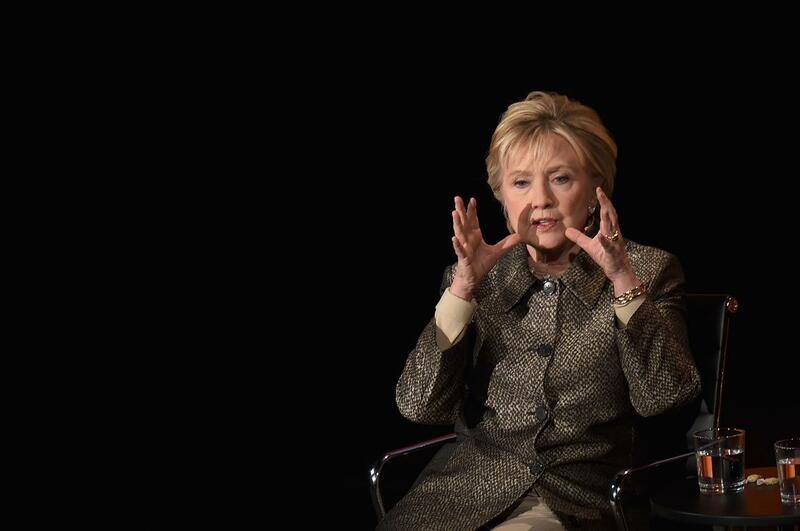 NEW YORK -- Hillary Clinton said she supported more aggressive action in Syria while she was secretary of state, and spoke out about what she believes the U.S. should do about the worsening crisis. She addressed the issue in what was billed as her first public interview since her election defeat, at Tina Brown’s Women in the World summit Thursday in New York. Syrian President Bashar al-Assad, Clinton said, had “an air force, and that air force is the cause of most of the civilian deaths,” which is why she had supported a no-fly zone. “I believe we should have — and still should — take out his airfields and prevent him from being able to use them,” Clinton said. In a 2013 speech to Goldman Sachs that was excerpted on WikiLeaks, Clinton acknowledged that a no-fly zone would have “killed a lot of Syrians.” She defended that call to Chris Wallace at one of the debates, although she did not directly answer how she would have reacted if a Russian plane had breached a no-fly zone. In Thursday’s interview, conducted by The New York Times’ Nick Kristof, Clinton also spoke at length about her “devastating” defeat in the 2016 election, and she blamed Russia for the “weaponization of information” that led to distrust among voters. “Although he did shake hands with me,” she quipped, which drew laughs from the audience. Clinton was the headliner at the three-day women’s conference, whose attendees shouted “we love you Hillary” as she walked off stage and gave her a standing ovation. Women in the World’s founder, Tina Brown, has a long history with Clinton. Clinton gave her first interview after the Monica Lewinsky scandal in the inaugural issue of Brown’s now-defunct magazine, Talk. Given the theme of the summit, it was hardly surprising that Clinton said, “I think it is fair to say that misogyny played a role” in the election. She mused that many people turned away from a female candidate because it seemed like too much change. Clinton also encouraged young people — “especially young women” — to go into public service, but she warned about the uphill struggle of being a woman in politics. Clinton shot down talk that she would run for anything else, saying she knows she will do “interesting things, but I don’t think that will include running for office again.” Clinton said she is writing a book. “As a person, I’m OK. As an American, I’m pretty worried,” Clinton said. Although Clinton said she “doesn’t take any pleasure” in the chaos, she did admit that it was “somewhat gratifying” last month when the health care bill did not come to a vote. “Having listened to them talk about repeal and replace for seven years — they had not a clue about how that worked. … I don’t even think they read the bill,” Clinton said. The three-day conference also included appearances by Canadian Prime Minister Justin Trudeau (whose comments about feminism swooned the mostly female crowd), Scottish First Minister Nicola Sturgeon, U.N. ambassador Nikki Haley and actress Scarlett Johansson. Comedian Samantha Bee introduced Clinton.